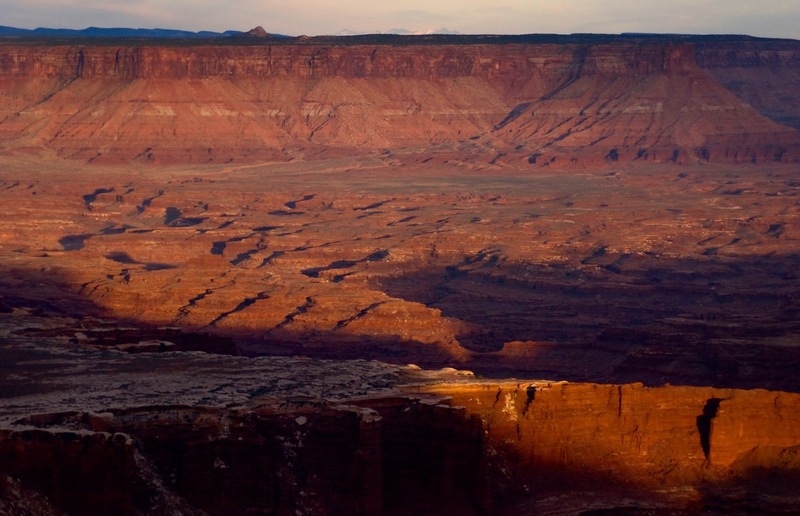 Sunset on Monument Basin viewed from Grand View Point, Island in the Sky District, Canyonlands National Park, Utah. Robert and I enjoy a discussion as we wind our way through eastern New Mexico. 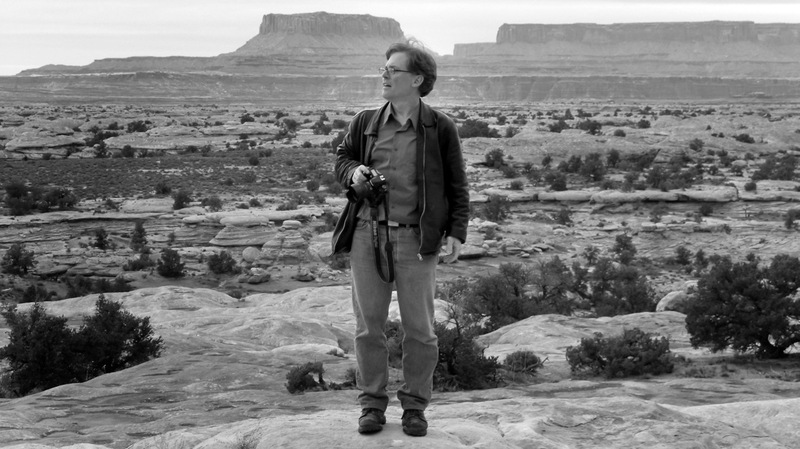 Unending, excellent conversation with my guest on this trip, fellow photographer Robert “R. E.” Stinson, who was so excited to be on the road shooting that his camera was in his hands more or less the whole time. We also made stops at the famous leaning tower of Britten, several abandoned houses on the road, and an excellent late afternoon long view of the interstate. 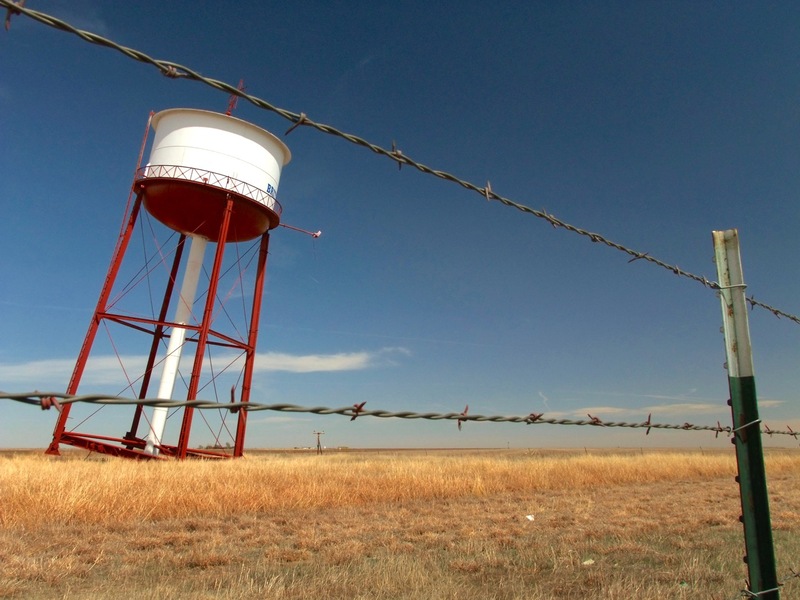 This is the famous “Leaning Tower of Britten,” in the Texas panhandle. It was one of our first stops. Robert had never seen the Cadillac Ranch in Amarillo, Texas, so for our first real photo opportunity of the trip, I was glad to introduce it to him. 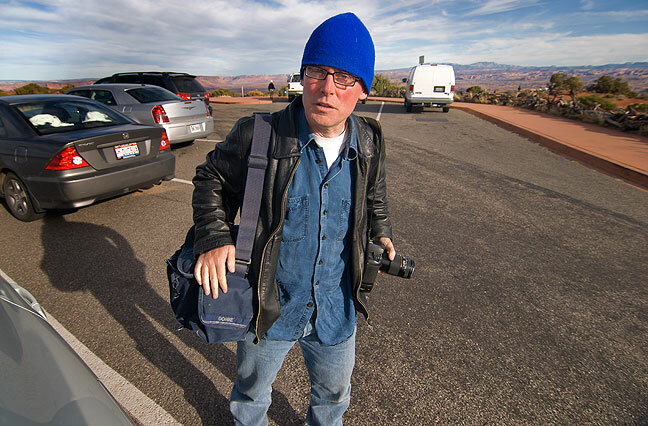 He brought a blue shirt, hat and scarf which we used as props for several images. Wheels spinning on one of the Cadillacs at the Cadillac Ranch, Amarillo, Texas, fittingly symbolic of the start of our road trip. Two passing tourists and their dogs at the Cadillac Ranch. Robert as a key compositional element in a Cadillac. Robert uses the blue scarf as a prop with the Cadillacs and the driving wind. 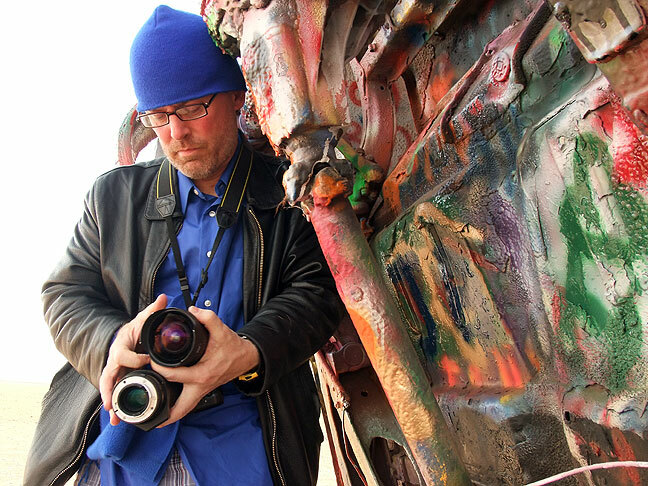 The author poses with a can of blue paint at the Cadillac Ranch. Blue scarf in the wind, Cadillac Ranch. Happy to be shooting Amarillo’s colorful Cadillac Ranch, Robert struggles to change lenses while hiding from a stout, dusty wind. 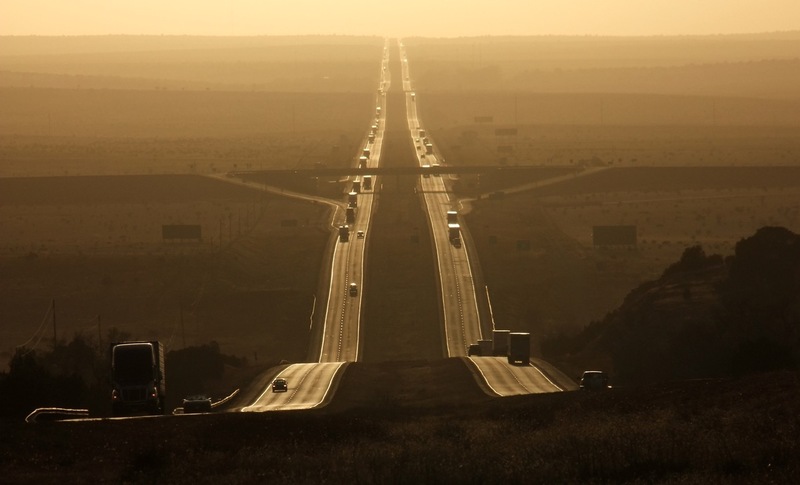 Robert makes an image of Interstate 40 in eastern New Mexico. This is the view Robert and I stopped to shoot looking west down Interstate 40 from the vicinity of Santa Rosa, New Mexico. 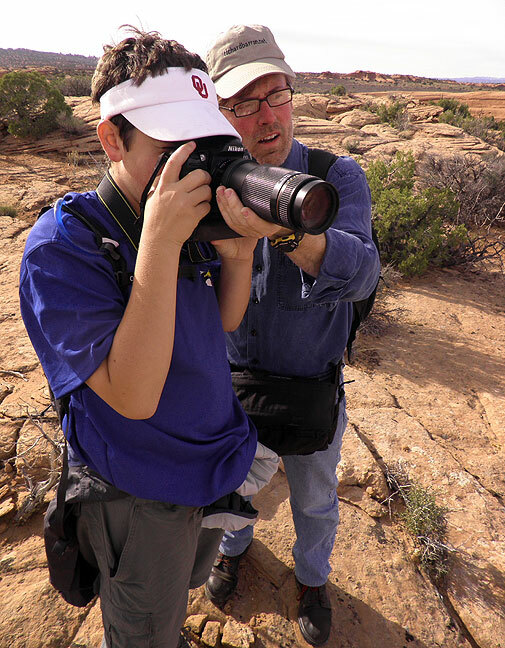 Robert gives photography pointers to David on the Delicate Arch trail. We met up in Farmington with Robert’s sister Deb and her son David early in the morning. They had driven from their home in San Diego. Our first stop was Four Corner’s Monument, where Deb and David tried to visit the night before, but were unable because of a time zone miscalculation. We all had some laughs standing in four states at once, and I bought Abby some nice gifts from the local traders. Since my last visit to Four Corners, the Navajo, who own the park, have made some improvements, including paving the ramps to the platforms overlooking the actual state lines marker, and building brick kiosks for the vendors. Also of note was the fact that the actual intersection of the four state lines was recently disputed in media reports, though in practice the notion that the monument might be in the wrong place seems largely irrelevant. 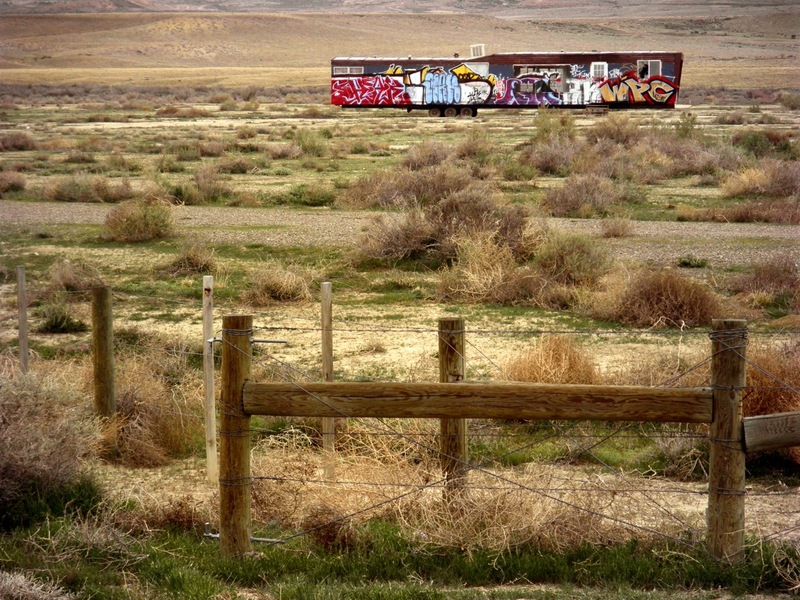 We stopped to photograph this tagged relic in the Four Corners region. Neither Deb nor David had seen Arches National Park, so we decided to make our way there. We drove from Four Corners up the Aneth highway, and had lunch at Peace Tree Café in Monticello, Utah. Farther along the way we stopped at Wilson Arch and Hole ‘n the Rock and had fun. Golf club sculpture, Hole-N-the-Rock, Utah. Sculpture made from power line insulators, Hole-N-the-Rock. Pool in pothole, Delicate Arch trail, Arches National Park, Utah. 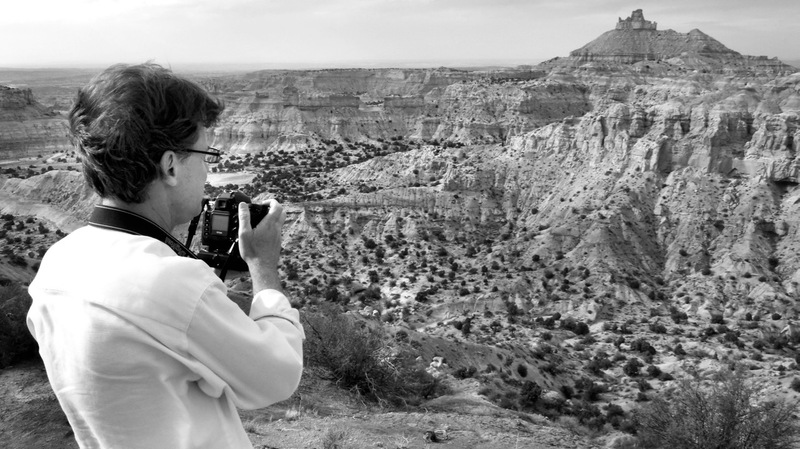 Deb photographs Wilson Arch on U. S. 191 in southeastern Utah. 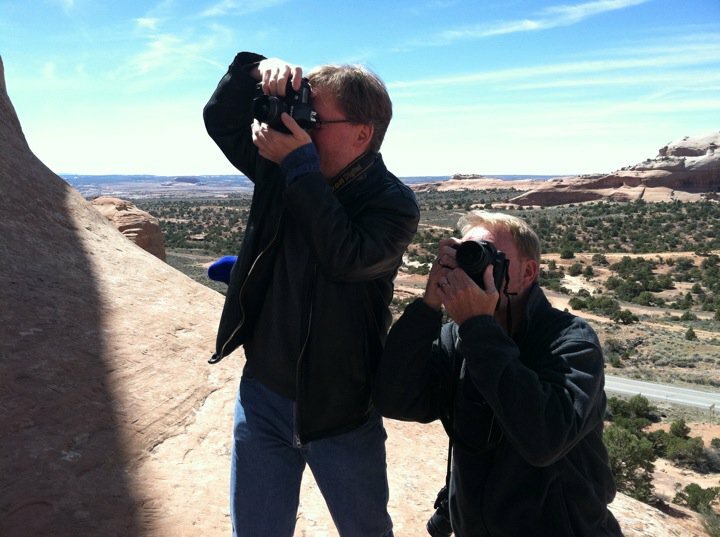 Robert’s sister Deb made this image of Robert and me photographing Wilson Arch. We made Arches by about four and hiked to Delicate Arch, and while it was hazy, we made a few decent images. To the amazement of Robert and me, we saw three digital Hasselblad medium format cameras, all on heavy tripods. This was my eighth visit to Delicate Arch, including four times with Abby. This was Robert’s second visit to the arch, the first being my wedding in 2004. With the light being stubbornly grey, I didn’t shoot very many images, and instead acted as tour guide for Robert and his kin. Everyone hiked well and seemed to have fun. 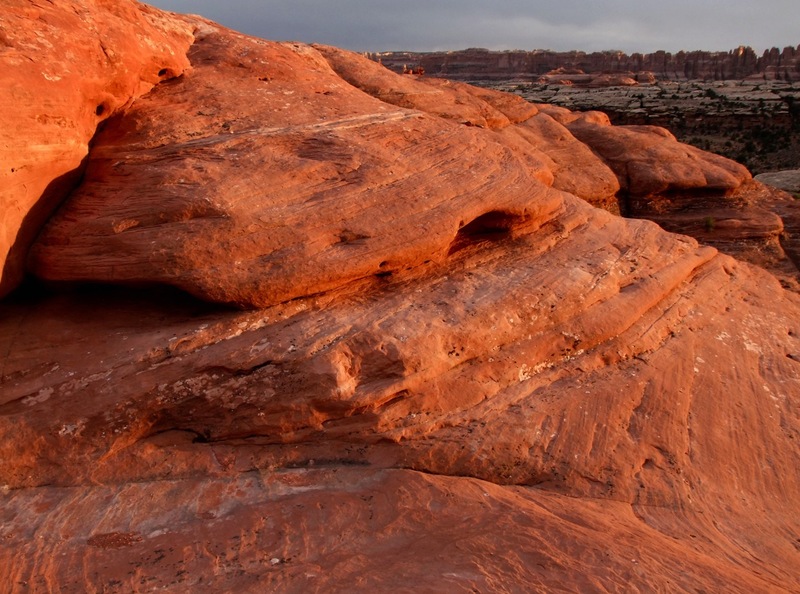 Dusk settles on The Fiery Furnace at Arches National Park. Here is another frame of The Fiery Furnace as evening approaches. Robert on the scramble to Frame Arch near Delicate Arch. Delicate Arch area as viewed from standing inside Frame Arch using my fisheye lens. Delicate Arch itself is visible on the right. There are two Hassellblad medium format digital cameras in this image, and there was another photographer out of the frame who had one as well. 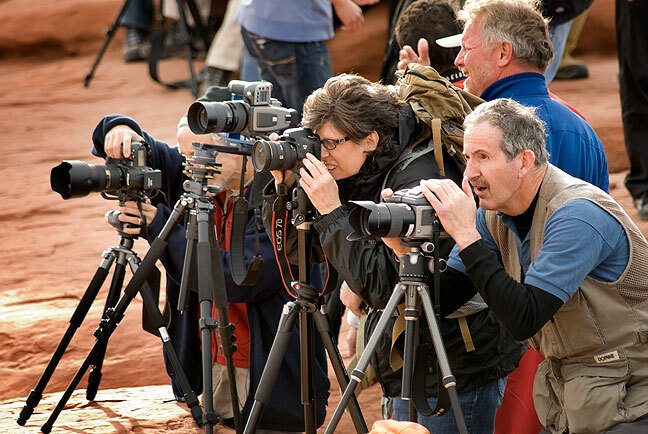 While we didn’t talk to these people about their cameras, each one of these machines cost at least $18,000. Broad panorama of the Delicate Arch area, including the “bowl” below it. Note the flat lighting. Deb and David pose for a photo in the Windows section at Arches National Park. By sunset we were in The Windows section of Arches, where we had some success with blue hour light. 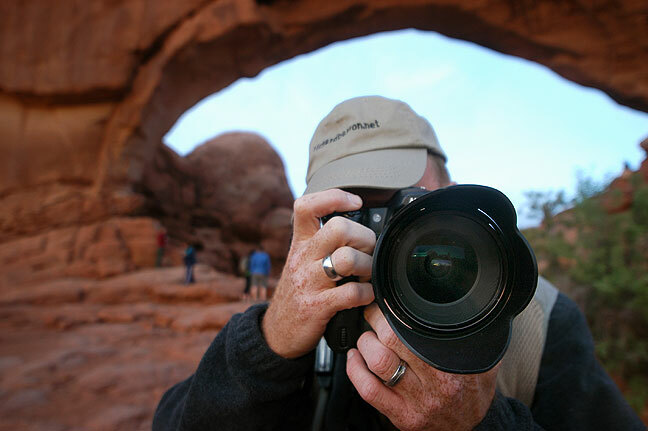 Robert shoots the North Window in Arches National Park with his 14mm. This is Robert’s frame made at the same moment, showing me shooting with my 12-24mm. The North window is behind me. 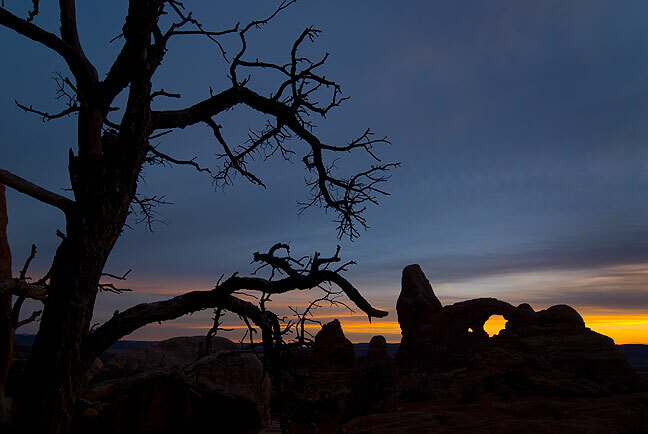 Dead Piñon Pine in The Windows section of Arches at sunset. 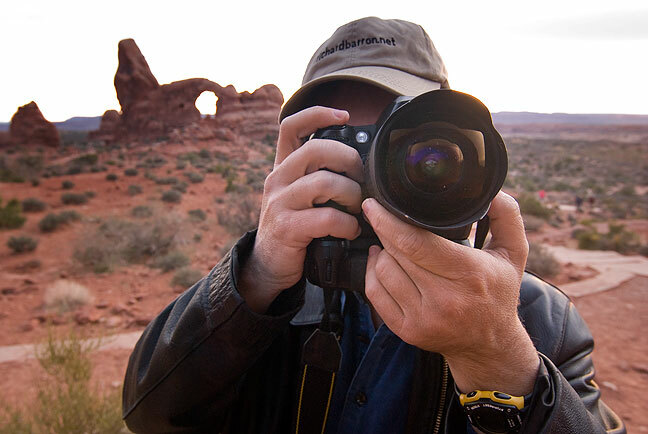 Your humble host makes pictures at dusk in Arches National Park. This image was made after sunset, in the Windows section from near the opening of Turret Arch. Our original travel template called for us to camp, but with Deb and David in town and rain in the forecast, we stayed in Moab. 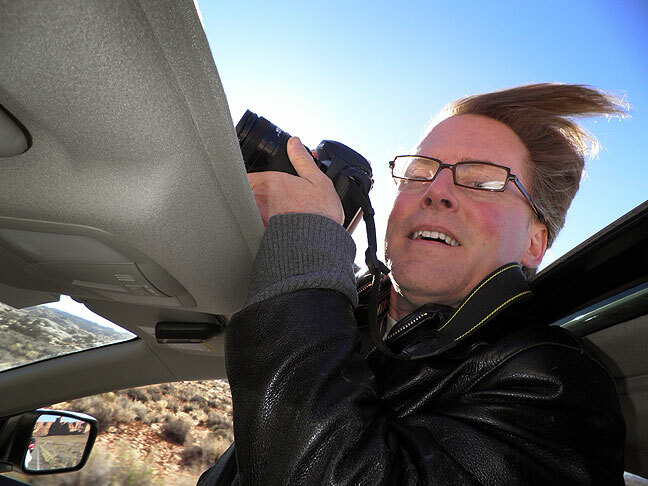 Overwhelmed by the beauty of Arches National Park, Robert shoots through my open sunroof. 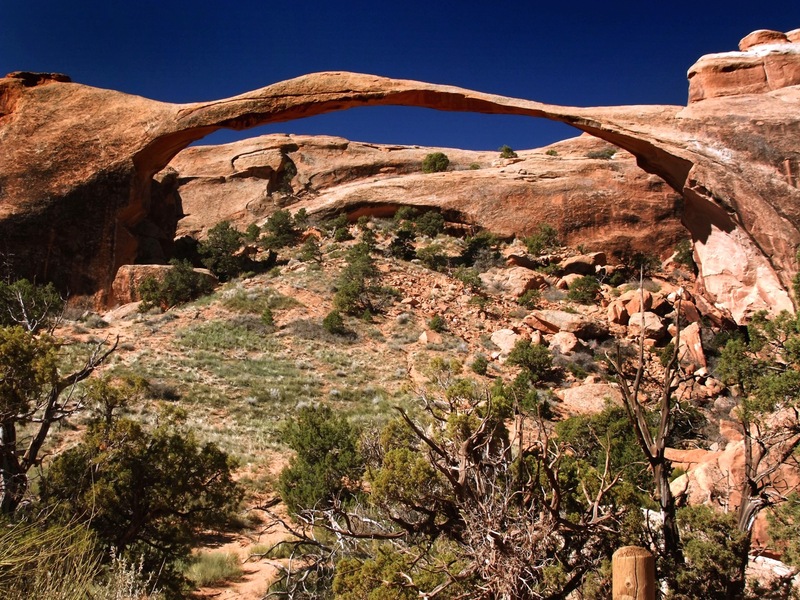 Landscape Arch, one of the longest spans in North America, is one of the first sites on the Devil’s Garden trail, and though it has been photographed many times, I always take time to shoot it in case it falls, which it eventually will. This is Wall Arch in the Devil’s Garden as it appeared in March 2004. Hiked with Robert, Deb, and David through the Devil’s Garden section of Arches National Park, taking the entire trail including the Dark Angel spur, the Navajo and Partition Arch spur, and the Private Arch spur. Abby and I hiked this trail on the day after we got married, and I hadn’t hiked the whole thing since then. Everyone did fine on the trail. 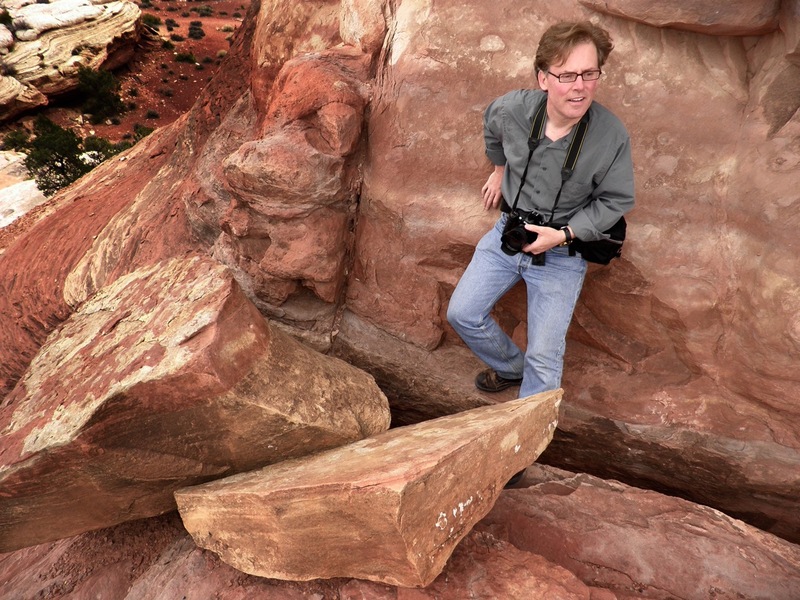 The park service has numerous signs warning that this hike is “primitive, difficult hiking,” but as I pointed out to Robert, even though this is the most difficult hike at Arches, almost every hike at Canyonlands is more difficult and primitive. Among other sites along this excellent trail was the remains of Wall Arch, which we passed and photographed on two occasions in 2004, but which fell during the night of August 4, 2008. The remains of Wall Arch as it appeared on this hike. Partition Arch in the Devil’s Garden at Arches National Park. This is me trying to look like a rock climber on the Partition Arch trail. Despite not being particularly primitive, the Primitive Loop has a lot of rugged appeal. The Primitive Loop follows the top of this fin for a distance before descending to the left. When we hiked it in October 2004 the wind was so ferocious that at one point Abby stopped and had to be coaxed into continuing. There is a fin just west-southwest of Double-O Arch on the Primitive Loop. 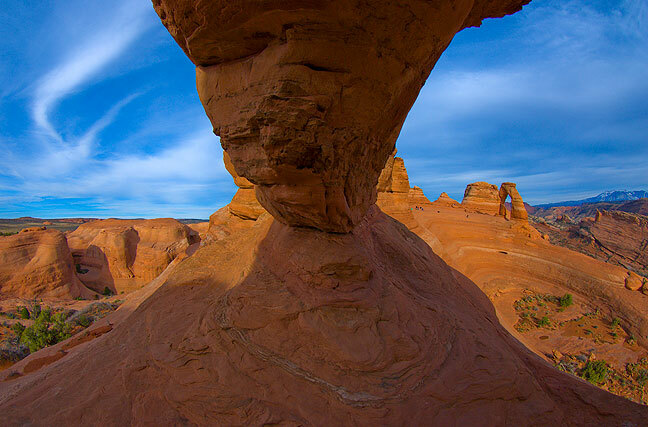 To make this image, my back was against that fin to make this view showing the arches and the Devil’s Garden beyond. 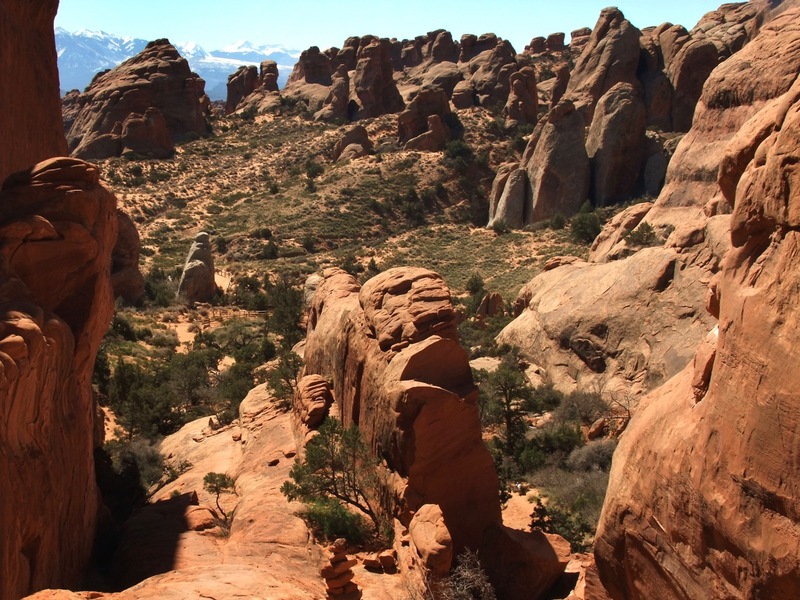 Near the northern reaches of the Primitive Loop trail in the Devil’s Garden section of Arches; Double-O Arch is shown in the right side of the frame, with the Dark Angel spire visible on the left side of the frame. This section of the Primitive Loop is nicknamed “Finland.” In the distance are the La Sal Mountains. Your host near Private Arch on the Primitive Loop trail at Arches. Deep in the heart of the Primitive Loop, this image was made very near Private Arch. Robert prowls the vicinity of Private Arch. Robert makes pictures from a slickrock dome on the Primitive Loop trail. Robert and his sister approach the most challenging portion of the Primitive Loop, a short scramble with some intimidating exposure to their right. Everyone made it through the section without too much fuss. With three hours of sun left, we drove to the Island in the Sky district at Canyonlands for the sunset. Robert, Deb and David shared excellent family time together, and after a period of grey and clouds, we were treated to intermittent sunshine right around the golden hour. As always, a quiet, reverent feeling gripped me as the day was ending in this place, one of the most beautiful in the world. 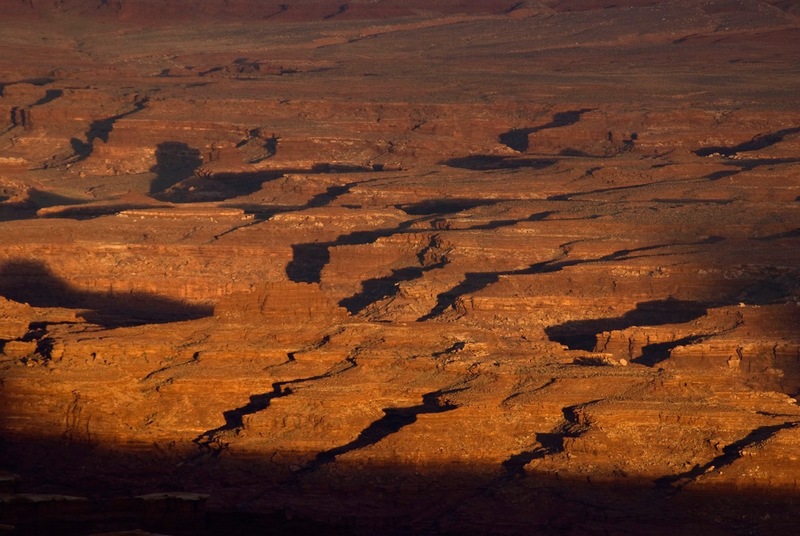 Layered sandstone at Canyonland’s Grand View Point, with Monument Basin below and the Needles district and the Abajo Mountains in the distance. Deb and David share laughs as Robert photographs them during our sunset session at Grand View Point. 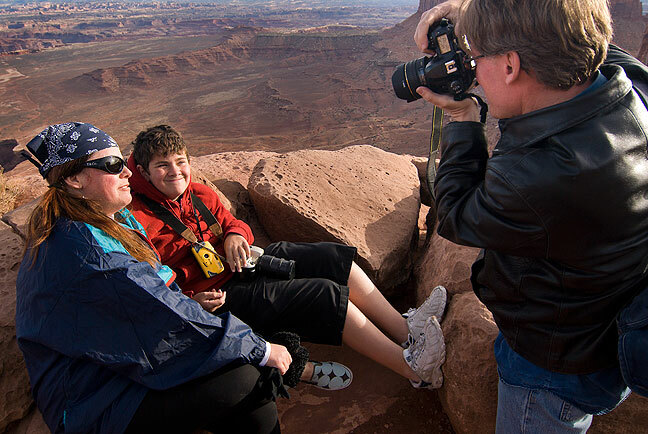 Deb and David look at the display on Robert’s camera in what can only be described as a “Kodak moment” while they take turns photographing each other at Grand View Point, Island in the Sky district, Canyonlands National Park. Robert and Davis take a turn posing for Deb. 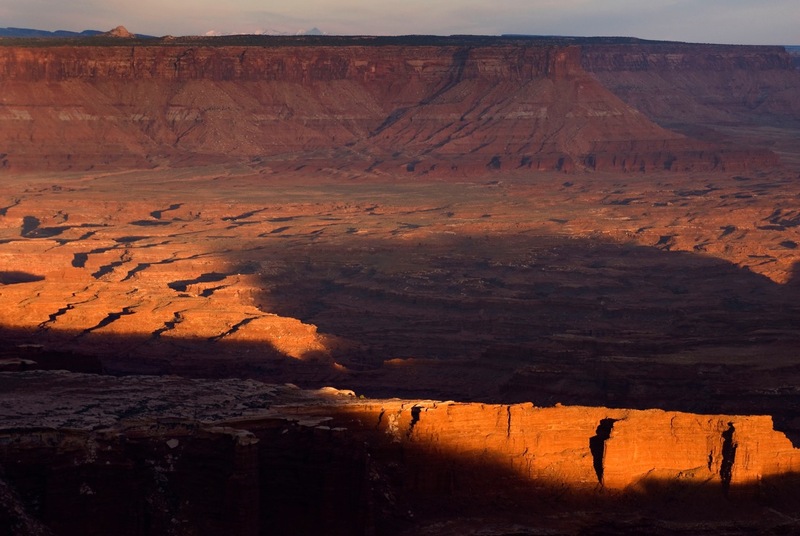 A streak of light crawls across the complex formations below Grand View Point, Canyonlands. Robert’s rendition of me deep in thought at Grand View Point. Last light graces the faces of Monument Basin below Grand View Point. Juniper and stone above Monument Basin, Grand View Point. View of The Needles and the Abajo Mountains from Grand View Point. Your humble host makes images at Grand View Point. 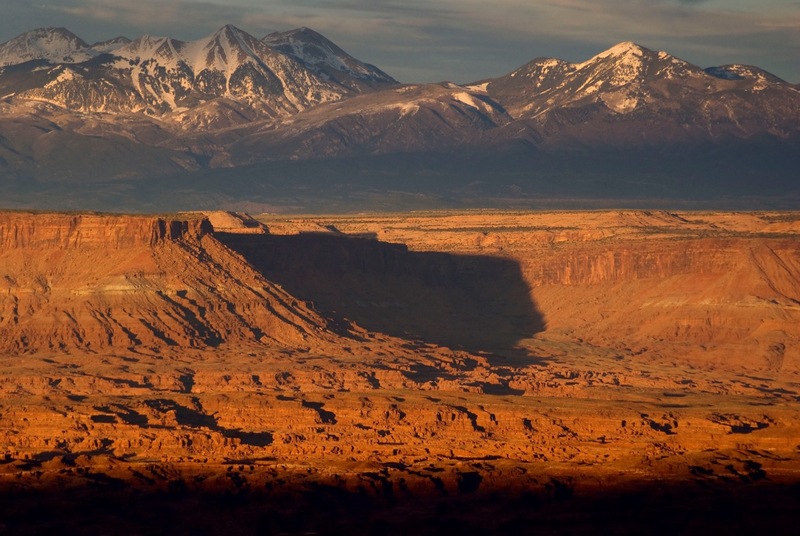 Last light on the La Sal Mountains viewed from Grand View Point, Canyonlands. 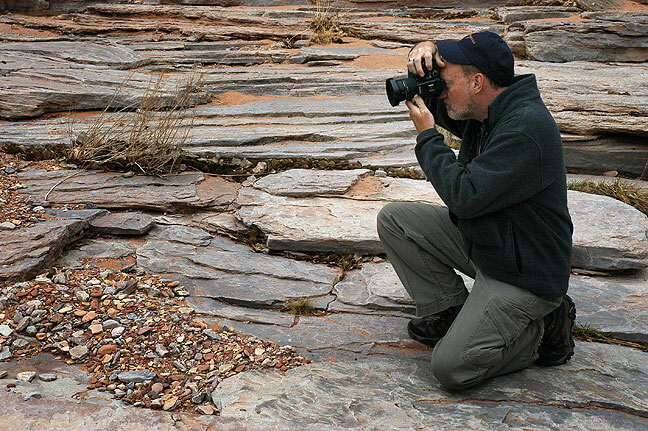 The author photographs the striated stream bed of Big Spring Canyon near the Confluence Overlook trail head at Canyonlands. Drove from Moab with a brief stop at the Needles Overlook, which I had not seen since Abby and I were there in 2005. Robert was impressed, but the light was somewhat uncooperative, and a cold wind fought us the whole time. Robert moves along the winding fence at the Needles Overlook, Canyon Rims Recreation Area, Utah. Phoenix drawing on dirty fender at the rock climbers parking lot, Indian Creek Special Use area south of the Needles district of Canyonlands. Your host smiles as we explore the Pothole Point trail area. By midday we were in the Needles district at Canyonlands, where we hiked two short trails I thought would be a good intro to the park for Robert, and also keep us close to the car due to the threat of rain. For much of the day we were greeted by grey skies and intermittent sprinkles. Despite this, we both made some excellent images. Robert was so blown away by the scenery and simply by being on this adventure that he photographed every stone, every twig, every cloud. Our first trail was one I hiked in 2005, the Slickrock Foot Trail. This 2.4-mile affair offers reasonably easy hiking to several impressive overlooks. 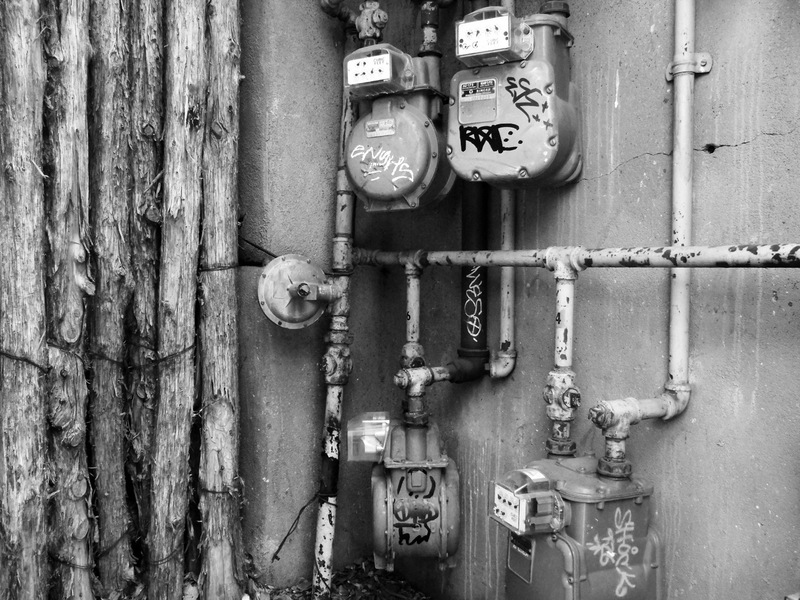 As in 2005, the light was quite grey and flat, so I ended up making quite a few of my images in black-and-white. We also scrambled around for a while at the Confluence Overlook trail head, where Robert became fascinated by a pair of ravens that stayed quite close to us for a while. Robert speculated we might have been near their nest, but I think the birds were more interested in a handout. With just a couple of hours of daylight remaining, we hiked the Pothole Point trail, which we explored in depth. The trail circles a formation of rocks we dubbed “The Speloetherm” after a phrase Robert had in his head (The actual word is speleothem), and two unusual formations at its base we dubbed its children, Frick and Frack. One of the overlooks along the Slickrock Foot Trail at Canyonlands. 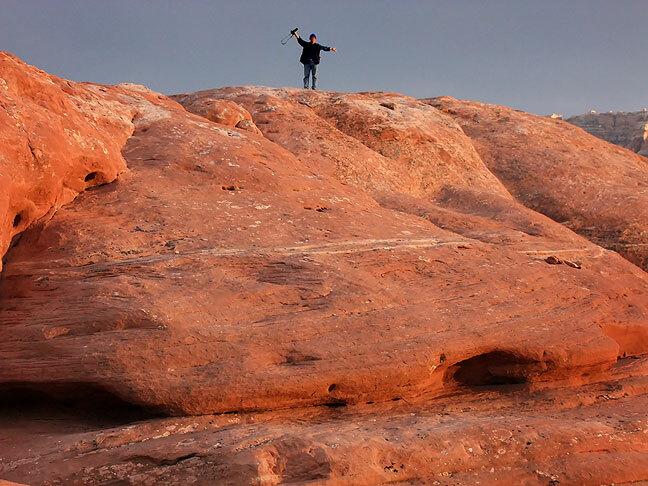 A hiker scrambles up a prominence to get a better view of Big Spring Canyon on the Slickrock Foot Trail. Big Spring Canyon and Little Spring Canyon merge near the center of the frame, with Junction Butte and Grand View Point visible on the horizon in this view looking northwest from the north end of the Slickrock Foot Trail. 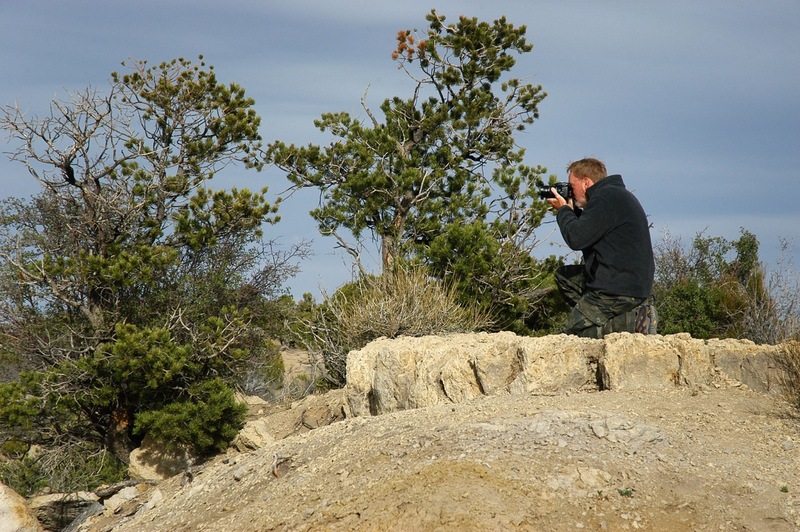 Robert photographs “Frick” and “Frack” on the Pothole Point trail. This image was made from a position inside the stone formations shown in the previous image. Driftwood and stones on the Pothole Point trail, Needles district, Canyonlands National Park. Robert takes in the scenery at the Pothole Point trail. Sunset seemed to be headed toward a cloudy nothing, but at the last minute, we were greeted by a spectacle of color to the west, just as we exited the park. 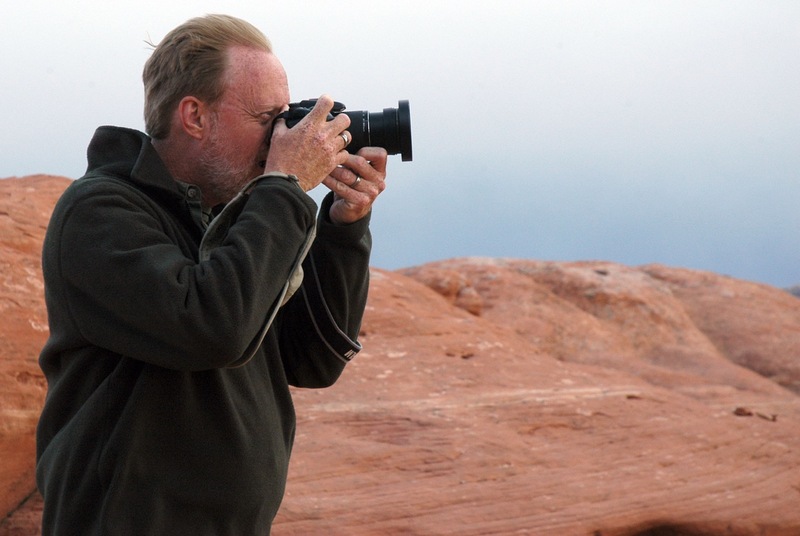 Robert points his camera at a band of brilliant color during sunset as we exit Canyonlands. Robert’s image of me at the bottom of a pour-off that’s part of the Peek-a-Boo trail; this is an example of what I mean when I say that all the trails at Canyonlands are more primitive than the Primitive Loop at Arches. 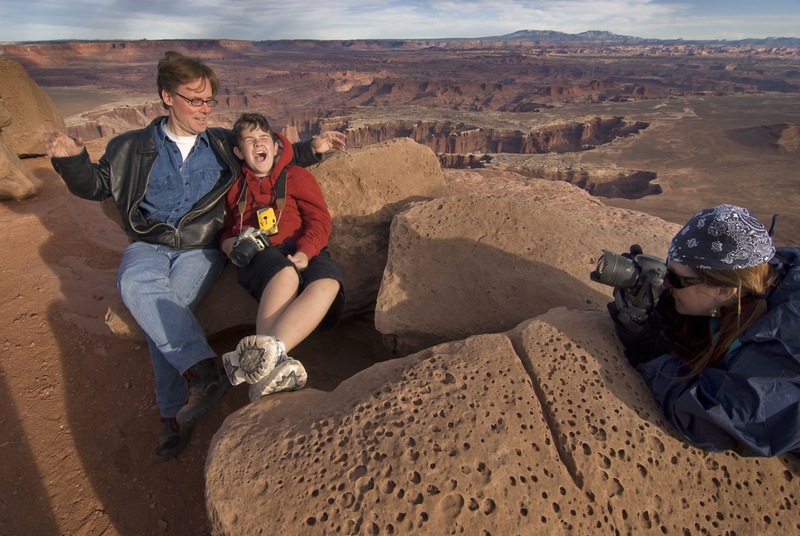 Despite some trepidation on Robert’s part about hiking a very long trail, I was able to convince him to hike the Peek-a-Boo trail at Canyonlands, which has been one of my all-time favorites since I first hiked it in 2005. The trail leads east from Squaw Flat, crossing through spectacular canyons and washes, through one small natural arch, and ending at the Peek-a-Boo backcountry campground, for a total of about 10.6 miles. The trail includes some scrambling and uses two steel ladders bolted to the sandstone. Robert wisely decided to leave his heavier cameras behind and travel light. Unlike more popular and crowded trails like those at Arches, the Peek-a-Boo trail was sparsely populated, and most of the people we saw were bearing backcountry packs, indicating they were hiking and camping deep in the labyrinth of Canyonlands. It is one of the reasons I like this area best. 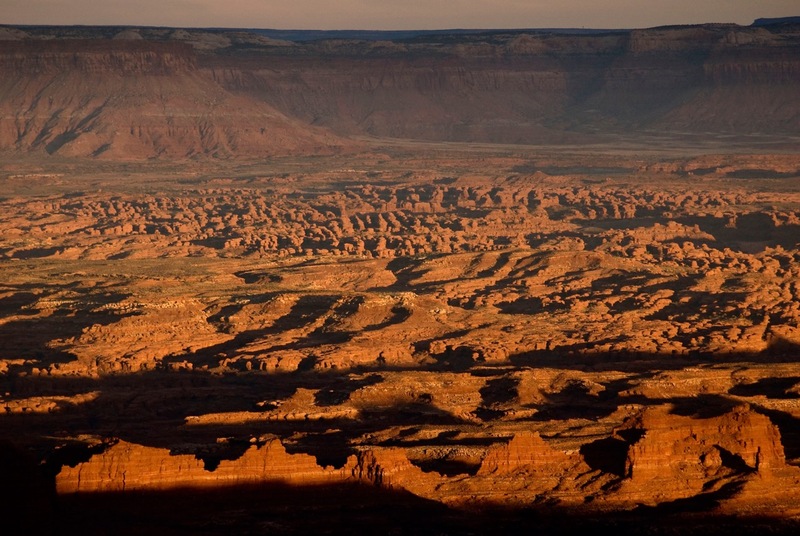 This image looks northwest from Wooden Shoe Butte south of Squaw Flat Campground at Canyonlands. I have photographed this spot many times, and it is not only very beautiful, I think it’s some of the most fun hiking I have ever done. This image shows me descending one of the two ladders on the trail leading south out of Squaw Flat; this ladder is a little awkward because of the fact that it is canted outwards a bit. Another example of the “primitive” nature of the hiking at Canyonlands, the trail serpentines down this slickrock slope along ledges that are barely as wide as a boot sole. 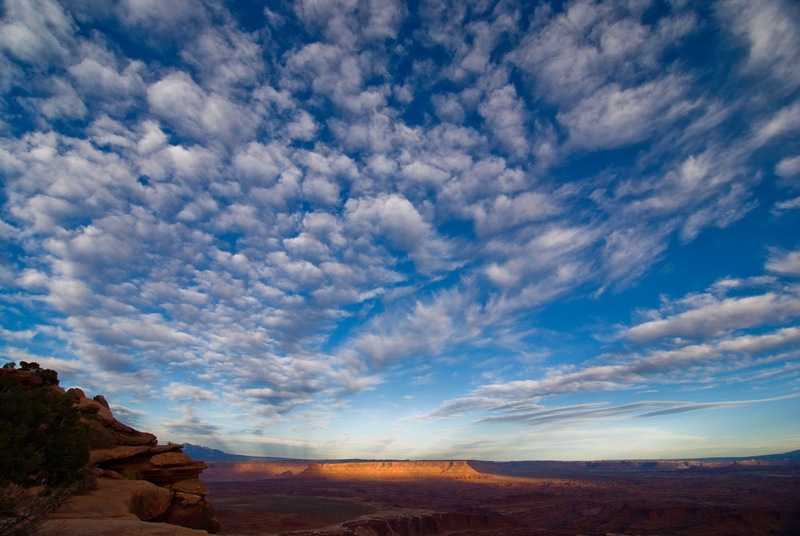 Brilliant clouds swiftly float past bold sandstone benches as we travel farther down the Peek-a-Boo trail. East of the intersection with Lost Canyon, Peek-a-Boo ascends this steep pour-off strewn with potholes. The climb requires some minor scrambling. 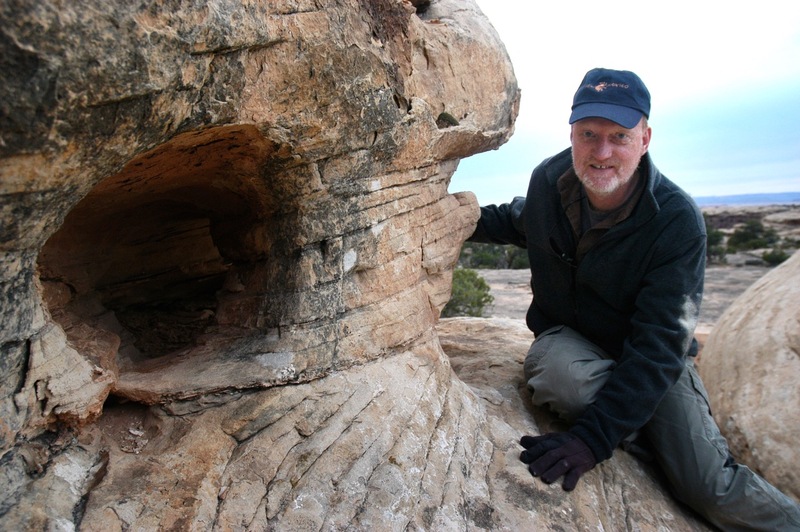 Complex, beautiful sandstone decorates the Peek-a-Boo trail. In addition to beautiful pinnacles, this trail ascends and descends many layers of Cedar Mesa sandstone. The author looks over a stone wall along the Peek-a-Boo trail. Deep in the best part of the Needles, backpackers ascend a steep switchback. We were very fortunate to have spectacular skies for this entire hike. 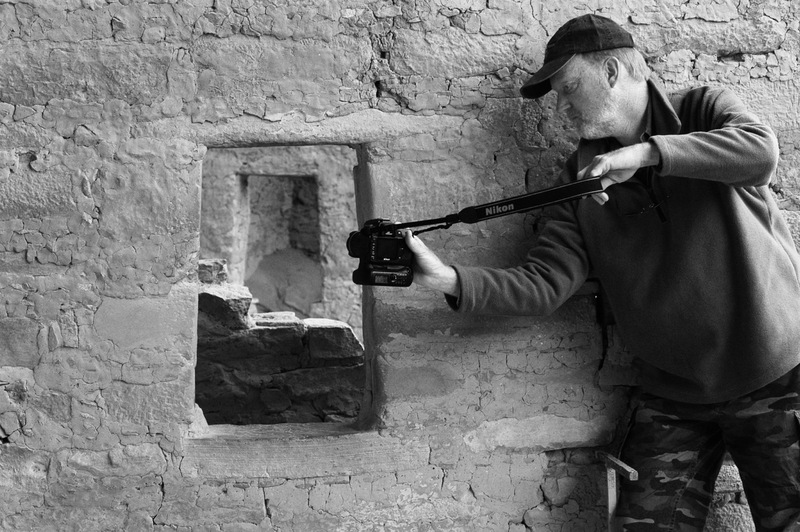 Robert photographs an eroded alcove. 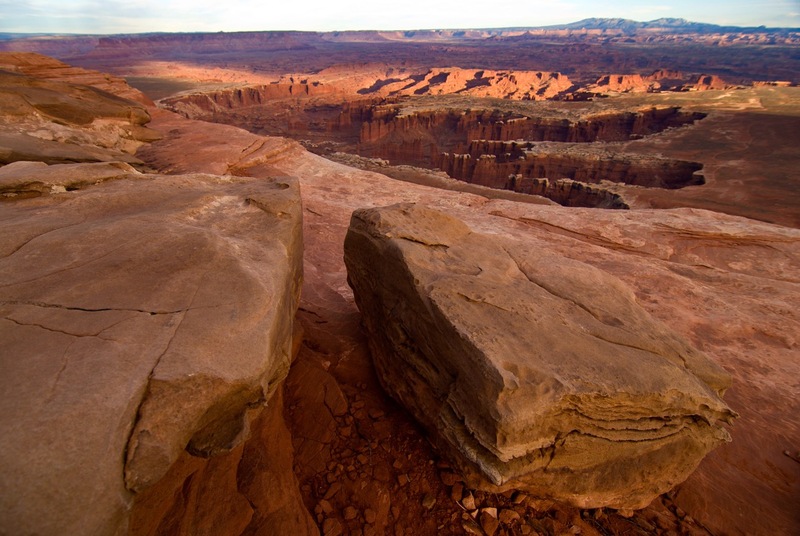 Like many of the trails at Canyonlands, this one follows a steep, layered pour-off. Robert takes a moment to pose at the small natural arch that is the namesake of the Peek-a-Boo trail. At the end of our portion of the trail is Salt Creek. This view looks down on Salt Creek and the Peek-a-Boo backcountry campground, which marked the terminus of our hike. 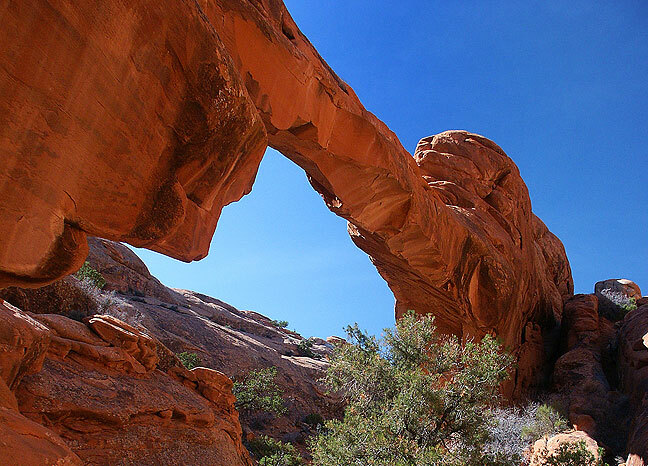 Two small natural arches stand not far from the Peek-a-Boo arch. A pine tree clings to its purchase in the depths of the Needles. Behind it is a handsome cliff covered in desert varnish. Viewed from directly above, this slickrock bench combines potholes and uneven striation to form an amazing repeating pattern. Robert asked me to make this somewhat formal portrait of him as we hiked. Robert descends the longer of the two ladders on the Peek-a-Boo trail; the Park Service suggests lowering larger backpacks with a rope on this ladder. 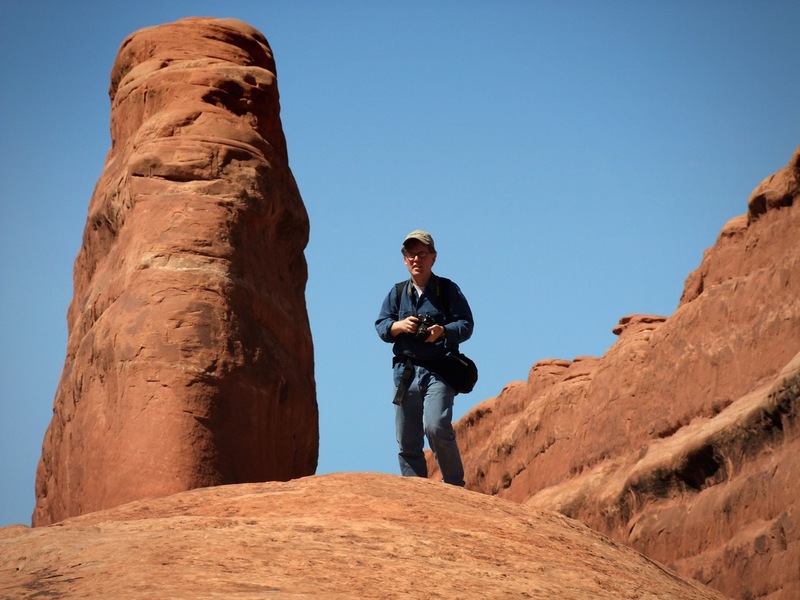 The author makes images as we near the end of our Needles hike. We returned briefly to the Confluence trail head area, looking again for Robert’s ravens. The light was more striking than the day before, and while we didn’t find the birds, the experience produced better images, at least for me. We bouldered around these spires while looking for ravens at the Confluence Overlook trail head on the north end of the Needles district of Canyonlands. This is one of the ravens we photographed in the cliffs and stones of the Confluence trail head. Robert explores the Confluence Trail trail head. Robert climbs up a slope in the Confluence trail head area. 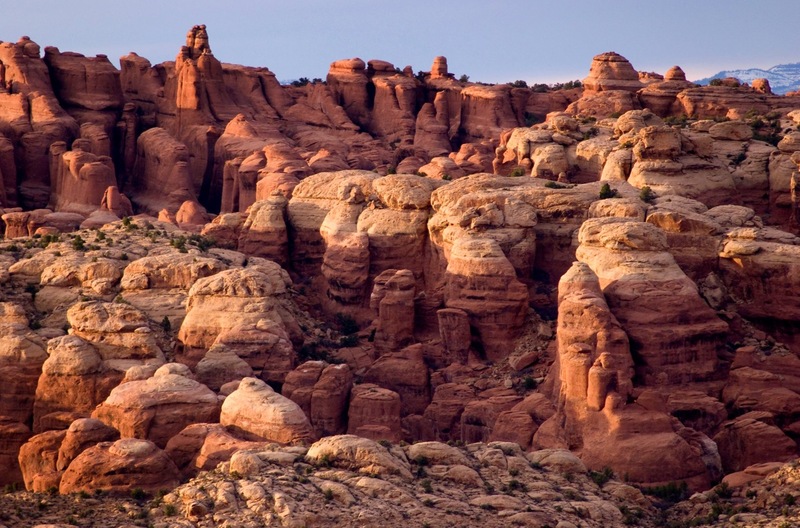 A bare branch frames sandstone formations during a momentary splash of late afternoon sunlight at the Confluence trail head. Another view of the delicate late afternoon light at the Confluence trail head. With light coming and going, many of my best images in this series were in black-and-white. Crack and plant, Confluence trail head. Since we were off the long trail before sunset, we also had time to explore the Squaw Flat area. We hiked around for a little while on the Campground trail, then followed it up a ridge via handhold cables to the top, where, despite ferocious winds, we made spectacular sunset images. The light was soft, but still had a pleasing color about it. The wind continued until right at sunset, when it died down. Robert described the experience as spiritual. Colorful wildflowers like these lined the roads at Canyonlands. The trail at the Squaw Flat Campground is short but very interesting, and includes some potentially challenging scrambling and bouldering. An example of the unchanging nature of the desert: the image on the left was made at a narrow pass on the Squaw Flat trail in 2002. The image on the right was made at the same spot on this trip, more than eight years later. This gap in the bench above the campground leads to a beautiful, open area of slickrock. The bench in the distance is served by a cable handhold and mokee steps, and is where Robert and I went to shoot the sunset. 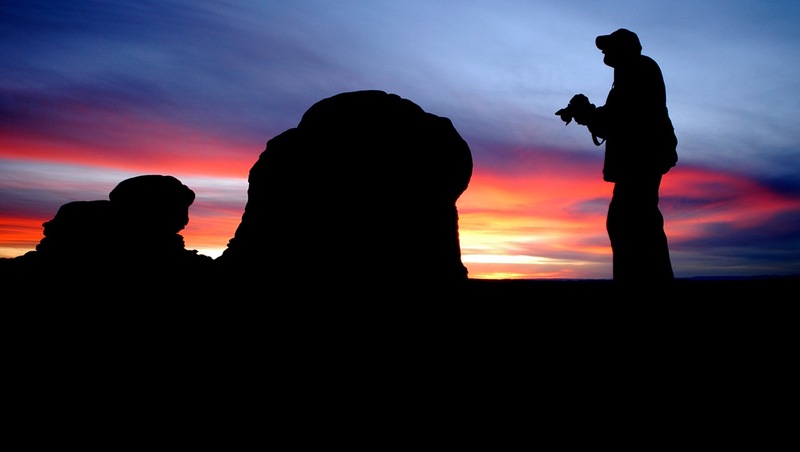 Elated by a breathtaking sunset and driving winds, Robert raises his arms as the last light leaves the Squaw Flat area at Canyonlands. Topping this bench afforded us beautiful views of the setting sun and opportunity to explore south for even more striking views of The Needles. Despite a frighteningly powerful wind atop the bench west of the Squaw Flat Campground, light from the setting sun repeatedly appeared and retreated from these buttes to our south. The wind was so powerful and full of grit that at one point I retreated to a crack between boulders, where I saw this scene and made the image. Robert looks incredibly rugged as he braces against the punishing wind, which in my estimation might have been 60 mph at one point. The sandstone at Squaw Flat picked up some truly unusual color and tone in the dusty sunset. We did manage to take a moment to play with Robert’s chrome hub cap. Zoomed in to longer focal lengths for images like this was complicated by the wind, making it difficult to keep the camera pointed at the subject like these benches to the south. This is a wider view looking southeast, with the sunset light maturing nicely. Your host battles a stiff wind to make pictures at Squaw Flat. Just as the sun touched the horizon, the wind diminished substantially. Robert and I found the whole experience wild, and at the same time spiritual. We observed these clouds hug the peaks of the Abajo Mountains above Monticello, Utah, as we started our longest day of hiking at Canyonlands. 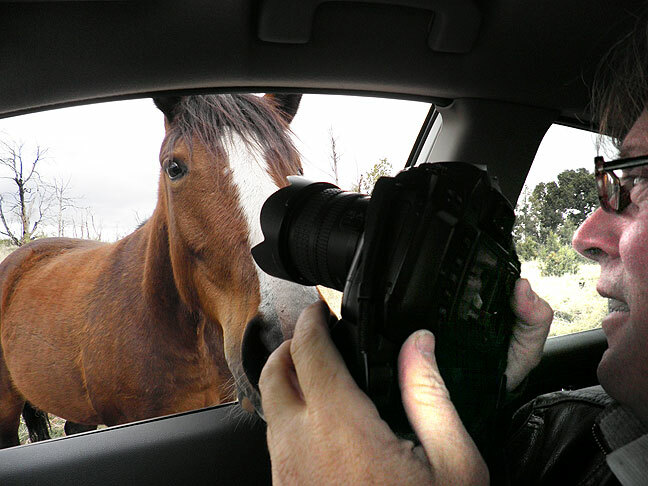 Robert gets a visit from a horse grazing at Mesa Verde National Park. Robert spotted the animals and wanted to photograph them, but neither of us expected them to be so tame and friendly. We started the day by driving from Monticello, Utah to Mesa Verde National Park in southwestern Colorado. I hadn’t seen Mesa Verde since Abby and I were there in 2005, and I wanted to take the ranger guided tour of the cliff dwellings. Unfortunately, the tour season wasn’t open yet, so we walked down to Spruce Tree House and made a number of images. One park ranger told me he believed that was the best way to experience Mesa Verde anyway. I was particularly pleased with my kiva images, and Robert and I both experimented with our fisheye lenses. Blossoms on trees, Spruce Tree House trail, Mesa Verde National Park, Colorado. 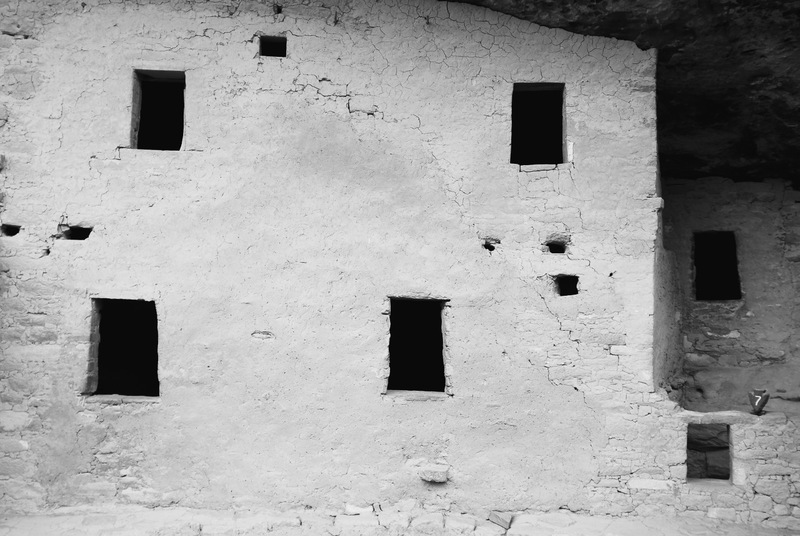 With subdued light, I found the cliff dwellings at Mesa Verde were rendered more compelling in black-and-white. 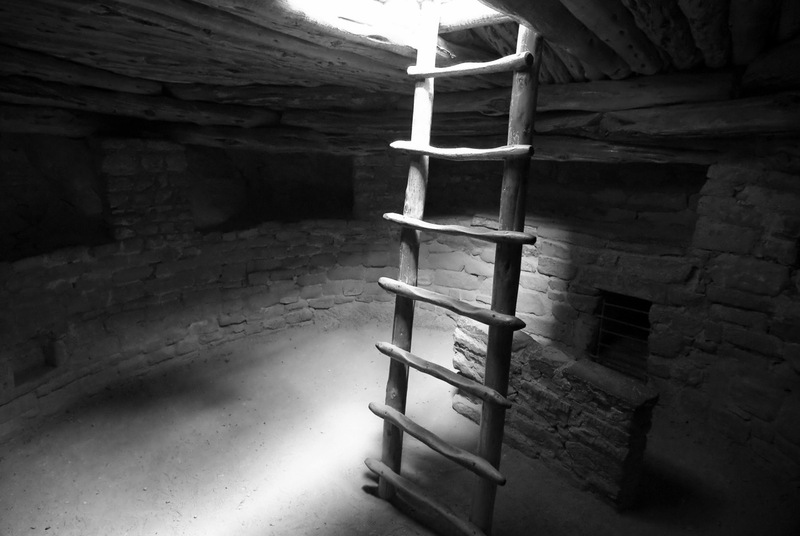 This is a fisheye view inside the restored great kiva at Spruce Tree House. 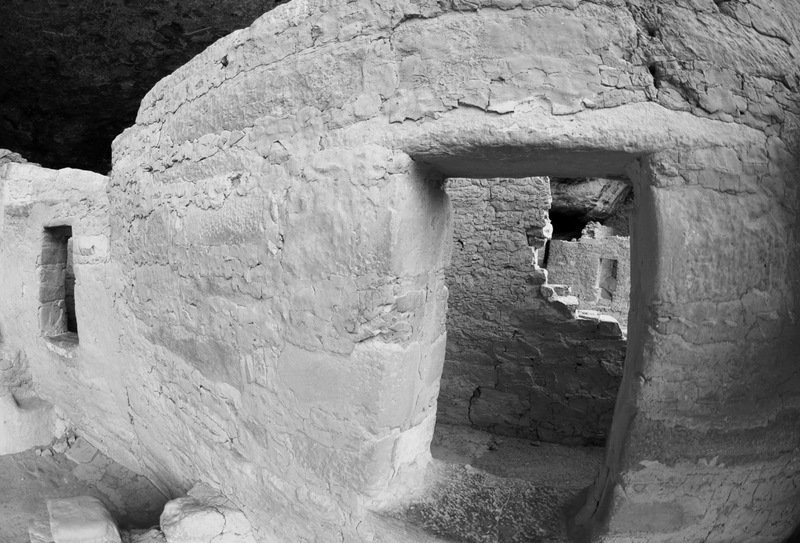 The ancestral masonry at Mesa Verde is quite similar to that at Chaco Canyon in New Mexico. In this image I am leaning over a Park Service partition with Robert’s 10.5mm fisheye on my camera (we traded fisheye lenses for a while) to make an image looking through the window at Spruce Tree House. This is the result of stretching across to the window with the 10.5mm. 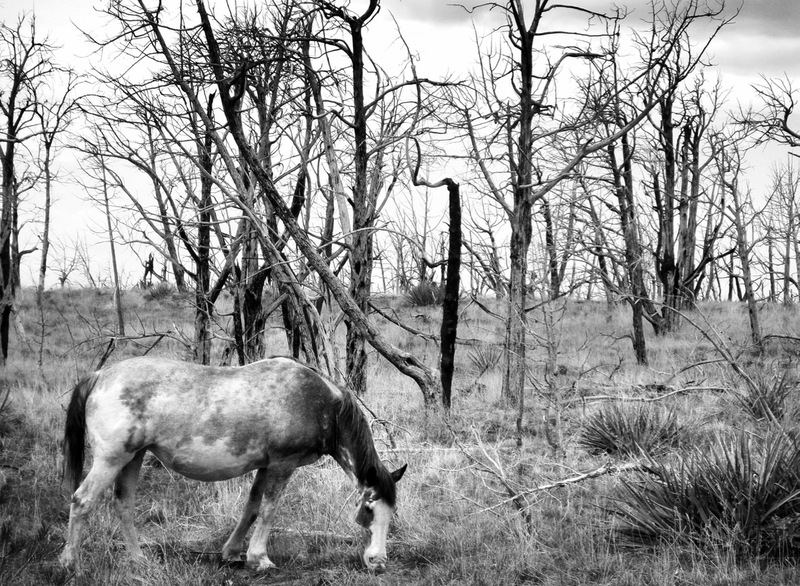 Robert spotted this handsome grey horse amidst the burned forest at Mesa Verde, and we stopped to photograph it. 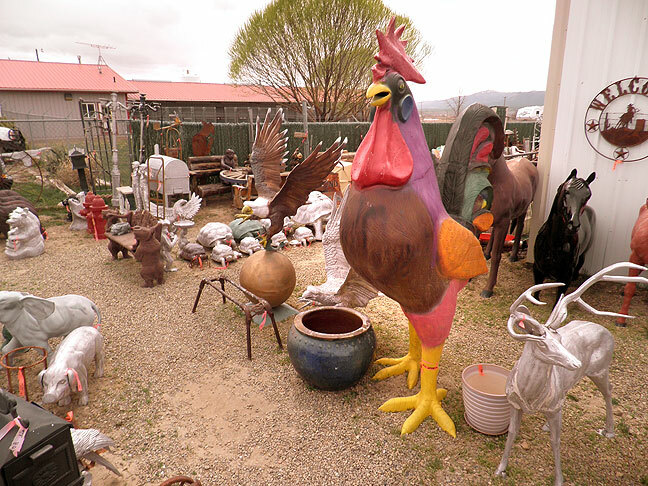 We stopped at this junk shop in Cortez, Colorado because Robert has been toying with the idea of touring the country with a giant chicken. We bought some nice gifts for our ladies at this friendly establishment, but this 10-foot-tall chicken, at $1800, was a bit out of our price range. From Mesa Verde we headed south across the border through the Chimney Rock Draw area toward New Mexico, passing the bean mills and low, rolling valleys of southwestern Colorado along the way. Our next goal was what we have alternately called Kirtland Valley or Fruitland Valley, thought Robert repeatedly referred to it as “The Valley.” The area is a stretch of highway that follows the San Juan River, leading Robert to quip, “If you’ve San Juan, you’ve San them all.” This region is also home to The Hogback, an impressive stone ridge just north of the highway. I have seen The Hogback many times, and though it is impressive, it’s hard to photograph. This rendering made more sense in black-and-white. 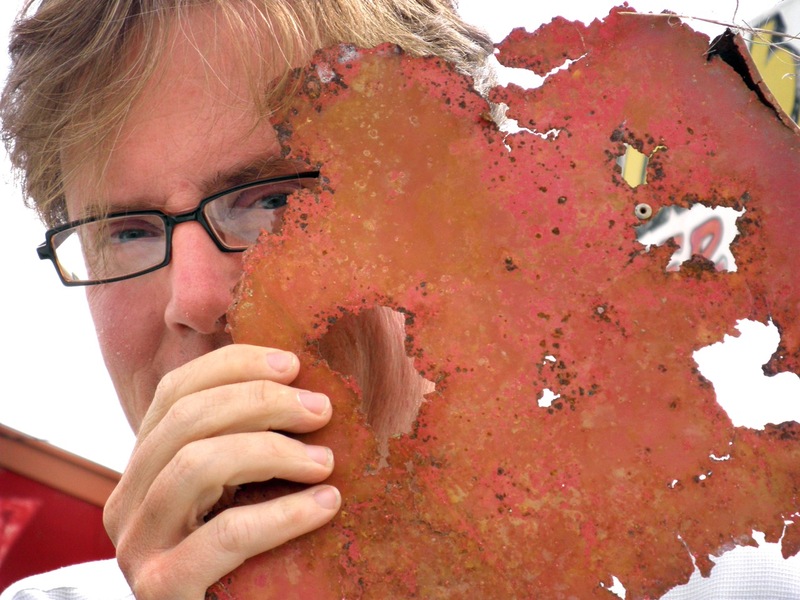 Robert poses with a piece of debris on the road in northwestern New Mexico. According to Wikipedia, Kirtland, New Mexico was founded in the early 1880s by Latter-day Saint settlers who named it after Kirtland, Ohio. Kirtland is the largest of a series of small towns between Shiprock and Farmington where Robert wanted to photograph an assortment of odd abandoned buildings and businesses, as well as The Hogback. 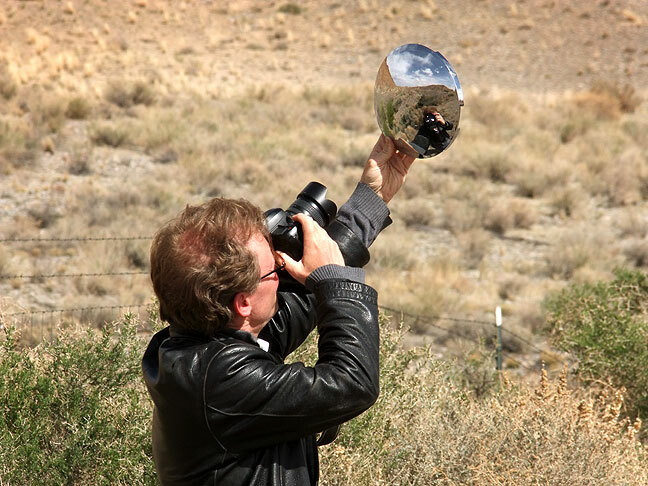 Robert uses a reflective chrome hub cap as he makes pictures near The Hogback in northwestern New Mexico. By late afternoon we were in the vicinity of Angel Peak, where we stopped for a while and made pictures when the sun occasionally emerged from the clouds. We found this monument as we were leaving Angel Peak Scenic Area in late afternoon. I spotted it out of the corner of my eye and skidded to a stop on the unpaved road to photograph it. I think memorials like this are elegant and beautiful. As always, there was no one at Angel Peak except us. We saw one occupied camp site, but the occupants were away. This tree in the campground at Angel Peak provided a stark contrast to the pale, deeply eroded sandstone-capped mesas and slope-forming mudstones of the Nacimiento Formation. The light ebbed and flowed on the day we visited Angel Peak, and it made a few decent images, like this view of one of the Angel’s companion peaks. The author photographs the beautiful white cross memorial on the drive out of the Angel Peak area. Here is another frame of me battling the breeze to make pictures at Angel Peak. I don’t know exactly why this type of traditional monument moves me the way it does, since I am not a religious person, but I find them an elegant, dignified subject for my imaging. This view is from the road near where we photographed the white cross. 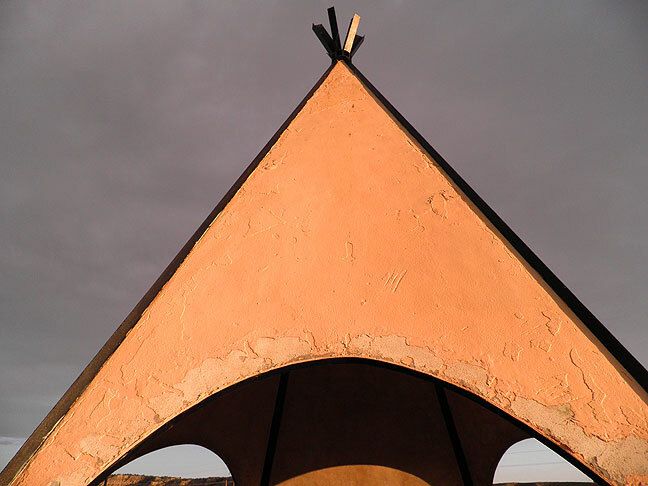 Our last photo opportunity on U. S. 550 in northwestern New Mexico was this teepee at the Apache Nugget Casino. Robert had been after me for two days to find a teepee for him to photograph, and we saw this one just at sunset. 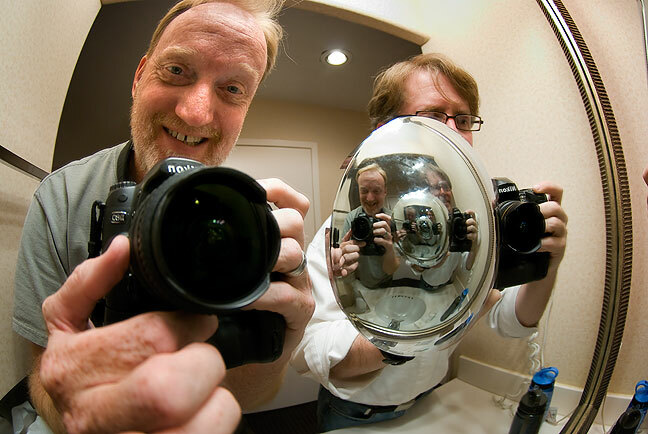 We stopped for the night in Santa Fe, New Mexico, where neither of us felt like we had made enough photos, so we got out our fisheye lenses and Robert’s reflective hubcap and played around in our motel mirror. Street musician on The Plaza in Santa Fe, New Mexico. Robert was extremely excited to wake up in Santa Fe. We drove to The Plaza, where it was weekend business as usual, with tourists and locals crowding the sidewalks. We photographed the beautiful Cathedral Basilica of Saint Francis of Assisi, then walked in concentric circles around the square, tightening our route to end up in the middle. We stopped at two photography stores, one of which was also a black-and-white fine arts gallery. Despite both stores being loaded with spectacular cameras, lenses and accessories, Robert and I managed to escape without spending any money. It was nice to actually be in a photography store again, since they have become increasingly rare in recent years due to internet sales. While I was photographing two street musicians, Robert went directly to a native American woman who was selling her wares on the sidewalk. He struck up a conversation and they became friends. I found it interesting that he went directly to her without even really looking at any of the other vendors. Robert was elated and amazed to wake up in Santa Fe, New Mexico. Somehow the high desert light has a way of making everything more beautiful, including these newspaper and magazine racks near The Plaza in Santa Fe. Like Moab, Utah, Santa Fe is teetering on being too obvious and too pretentious a place for art. I tend to like my artist communities a bit more undiscovered. Robert poses for a portrait immediately after emerging from the second photo gallery we visited in Santa Fe, thus the satisfied but slightly stunned look. 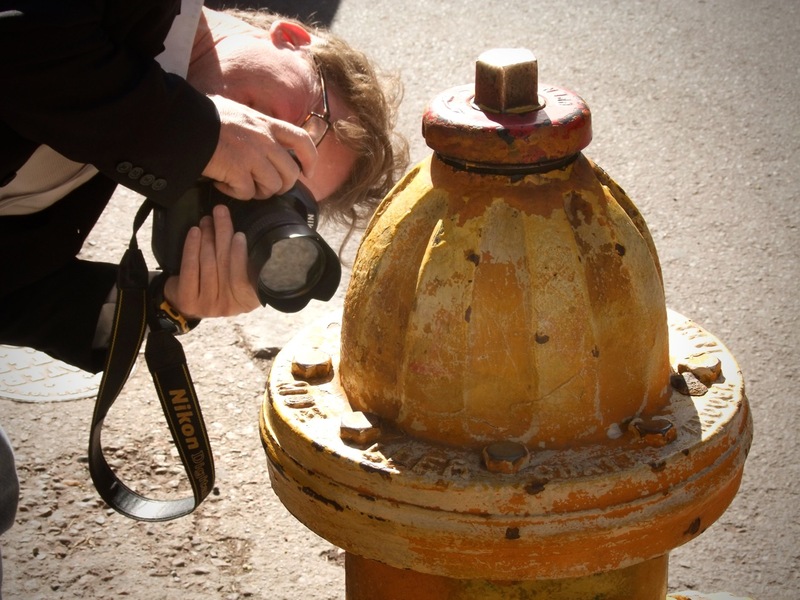 Robert photographs a fire hydrant in Santa Fe. This row of signs on The Plaza belies one discouraging thing we noted, that there were a number of closed businesses or empty storefronts in the area. In the midst of the typically crowded Saturday morning row of vendors on The Plaza, Robert made friends with one of the traders. They eventually exchanged phone numbers. A dog in sunglasses; need I say more? Santa Fe, particularly The Plaza, is one place where everyone expects to make pictures and be photographed, creating a very comfortable atmosphere for classic street photography. Near The Plaza is the beautiful Cathedral Basilica of St. Francis of Assisi. 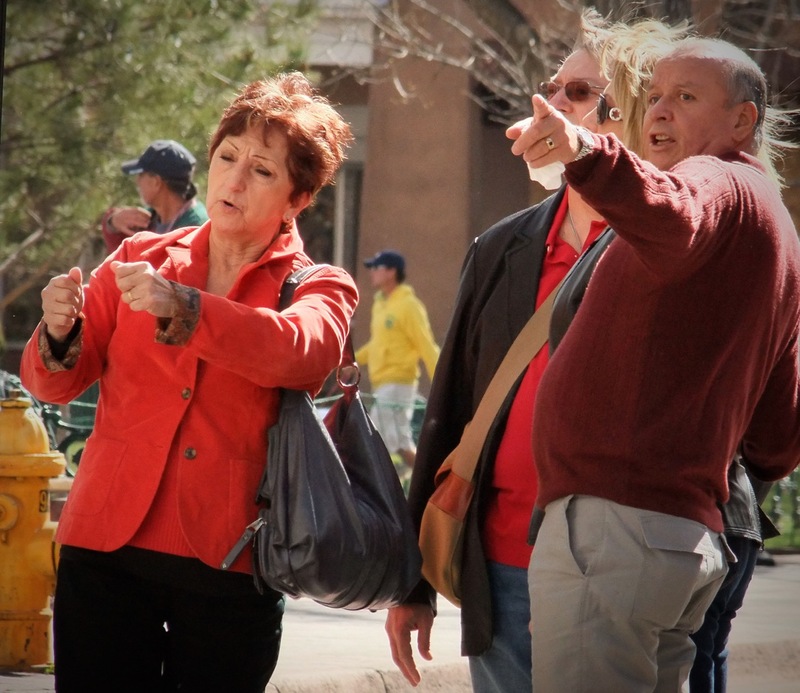 Here is another group of well-dressed Santa Fe tourists. This intersection of utilities seems like the polar opposite of the colorful, wealthy look of the Plaza at Santa Fe. 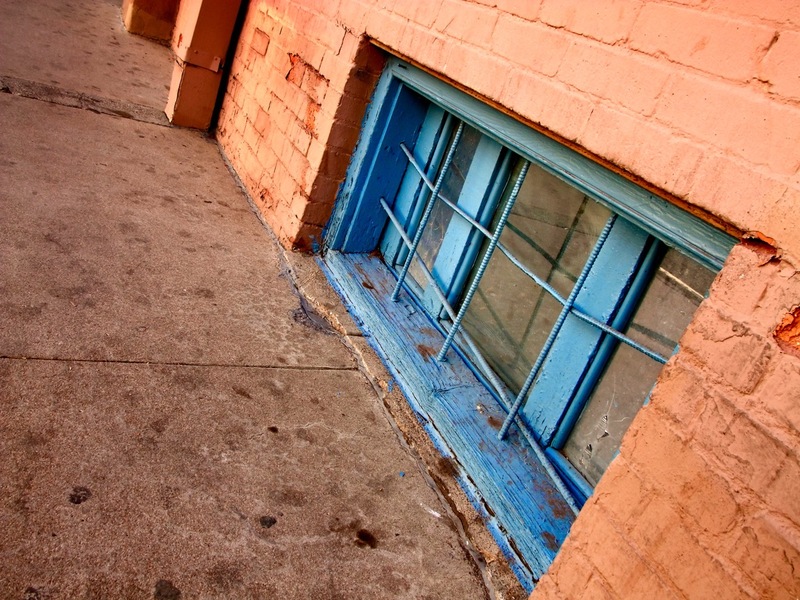 Property owners try to keep the streets of Santa Fe painted with the right colors. This elegant statue raises its arms into the beautiful, high-country sky. During the drive from Santa Fe to Clines Corners, on a road that runs north and south, we saw a semi-tractor-trailer rig staying on the shoulder and maintaining a 15-degree crab angle against the wind. Our discussions continued unabated as we made the long drive home. Robert poses with some bathroom tiles arranged to create a classic optical illusion. In Groom, Texas, we spotted this broken sign. These rusted tanks also caught our eyes in the Texas panhandle. Abby and I stopped to photograph these in 2003, and they haven’t changed. 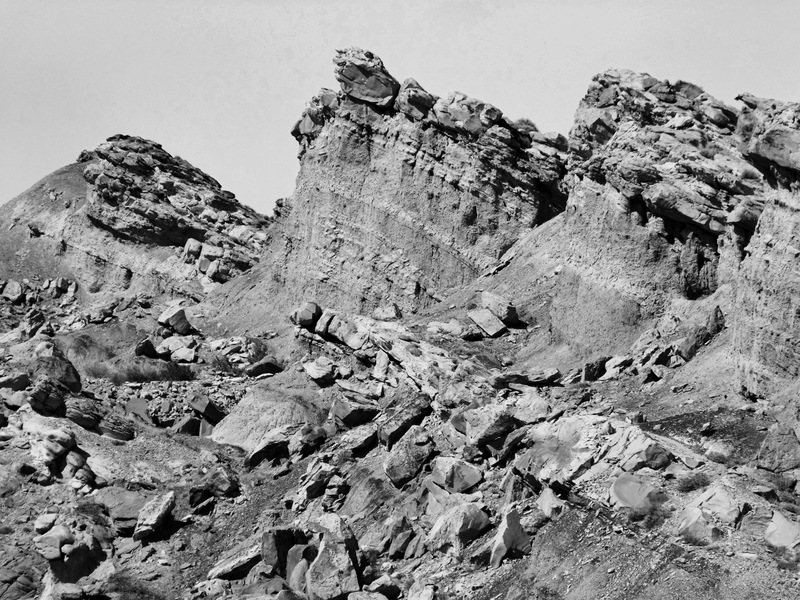 The brown tone in the image is from classic west Texas dust in the air. By late afternoon on our final day on the road, we were in Shamrock, Texas, where we stopped and photographed the landmark Conoco Tower. By sunset, we were in Oklahoma. Our trip was at an end. • New term: Force Op. It means that I am in a situation in which I wasn’t going to shoot a scene, but I feel like I am forced to shoot it because other photographers, particularly photographers in my party, are shooting it. 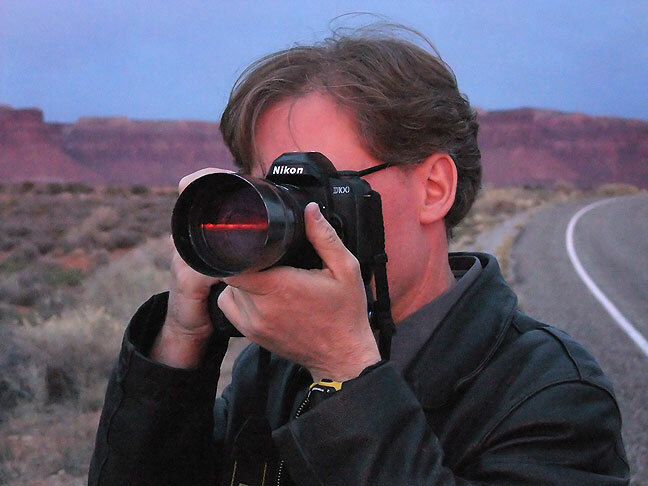 • Robert shot a total of 4876 images, and I made 2055 images plus four video clips. • We shot tons of images of each other, and the most of the images of me you see here are by Robert. 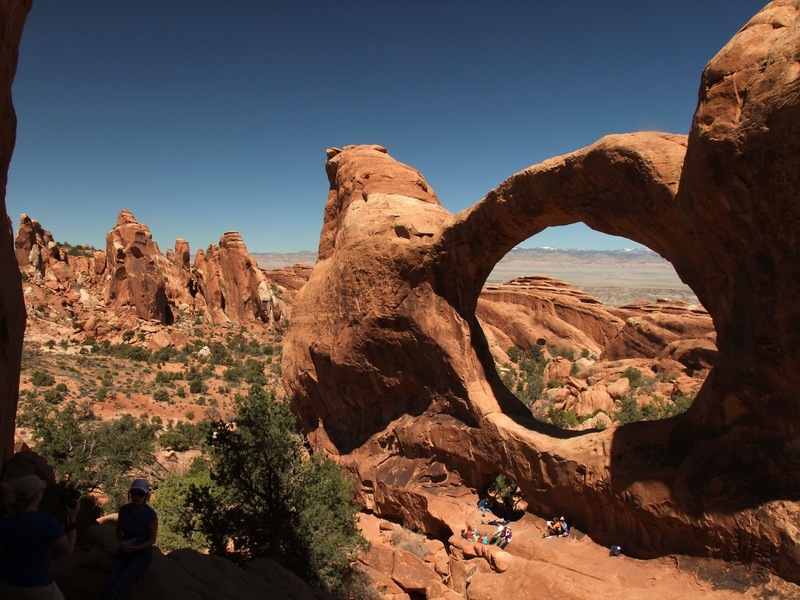 Arches: 1,014,405 visitors, ranked 68th of the 363 facilities operated by the Park Service. 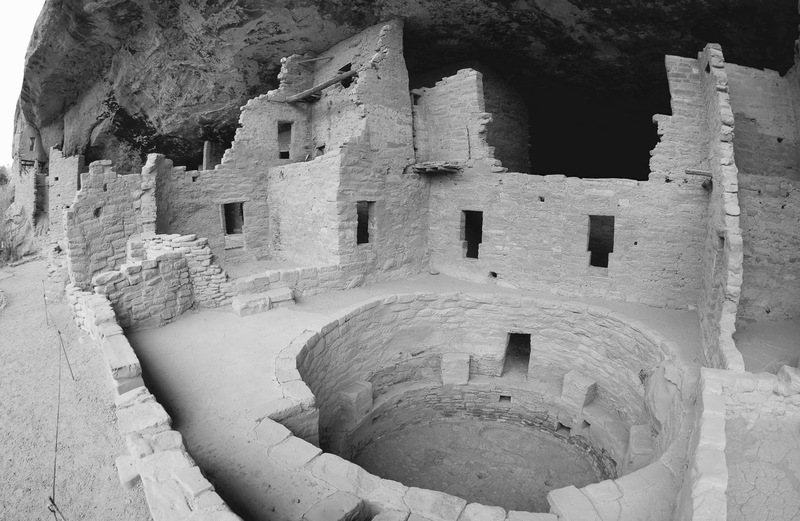 Mesa Verde: 559,712 visitors, ranked 113th. 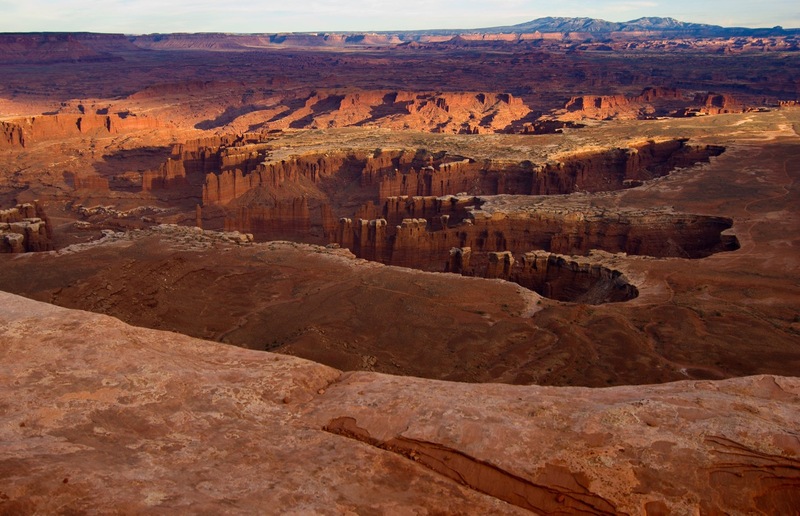 Canyonlands: 435,908 visitors, ranked 127th. • Other possible names for this trip besides “Art in Every Stone”: The Raven, Nevernmore, Unicorns with Rocket Launchers, In My Pants, Like an Idiot. 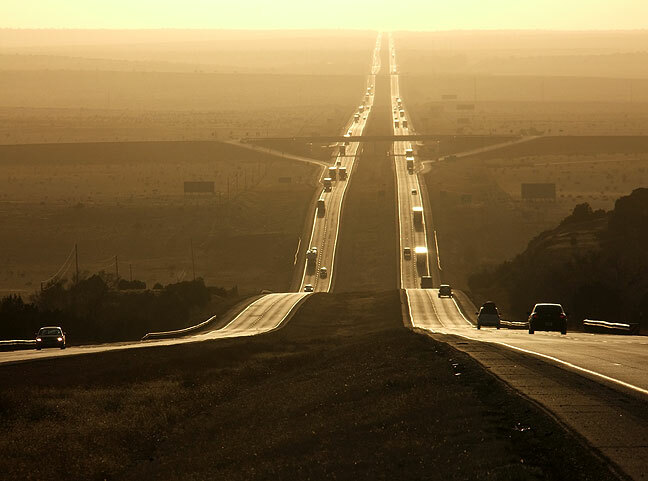 This view looking west down Interstate 40 was made extra powerful by the deep, hazy yellow light at sunset, and through the use of a long telephoto lens. I thought it was one of the strongest of the trip.